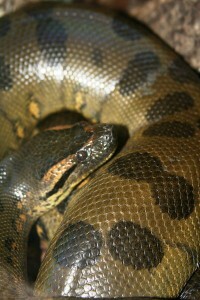 Anacondas are not venomous; they are constrictors. They kill their prey by squeezing tighter each time the prey breathes out which prevents the prey from taking in another breath. Due to the strength of the snake, suffocation, internal damage or heart attack usually takes place rapidly. Then swallow their prey whole, usually head first. The anaconda’s jaw can unhinge and the jawbones are only loosely connected to the skull, allowing the snake to swallow prey much bigger than the snake’s mouth.